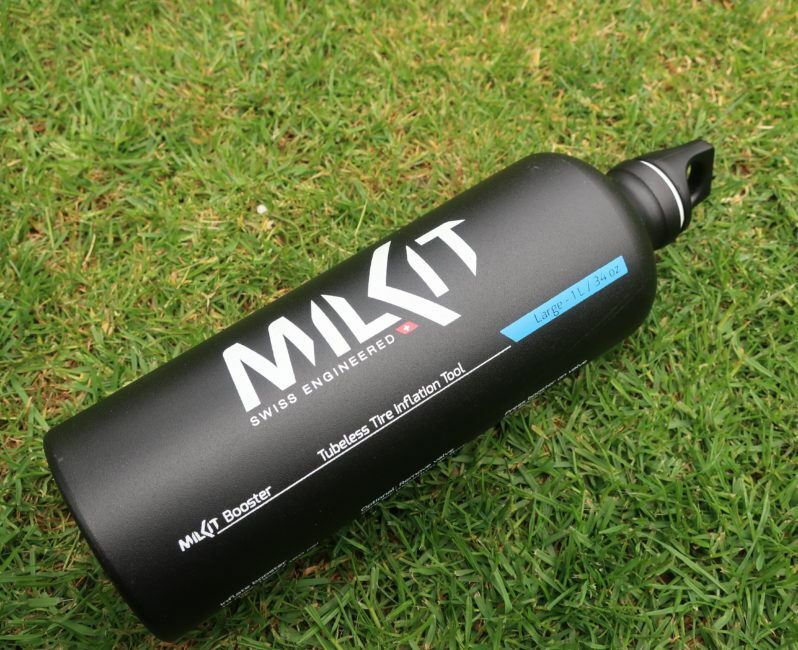 MilKit Booster Tubeless Inflator - ADVNTR. A quick look at the MilKit website is enough to persuade you that the Swiss company is on a mission. 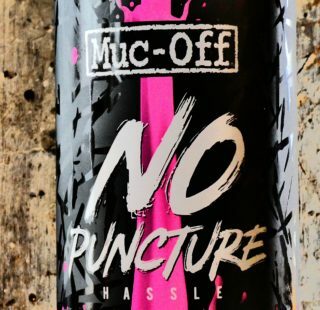 That mission is to corner the “Tubeless Tyre Management” market. For example, their tubeless valves make it easier to find out how much sealant still remains in your tyres. Not something I had ever thought of before but now…. New to their product range is The Booster. 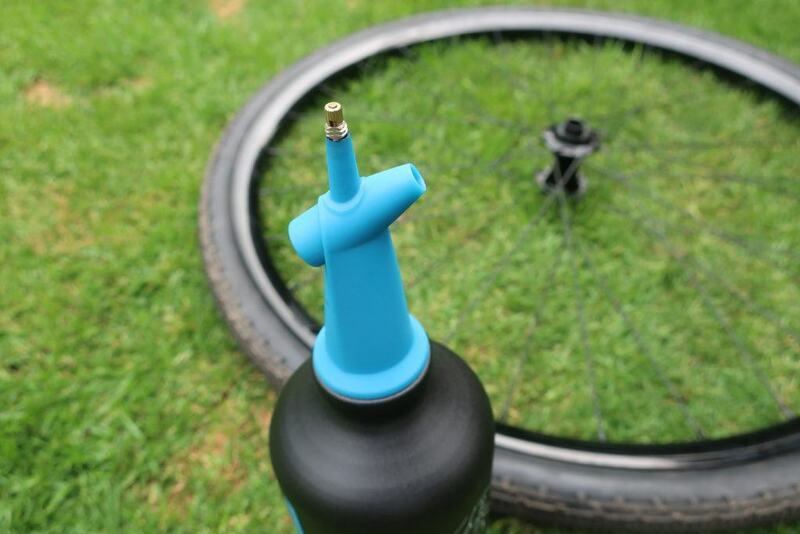 MilKit claim The Booster makes inflating tubeless tyres simple. Unlike a lot of the tubeless inflation tools which are destined to live out their lives in your shed, Booster is small enough to take out on rides with you. 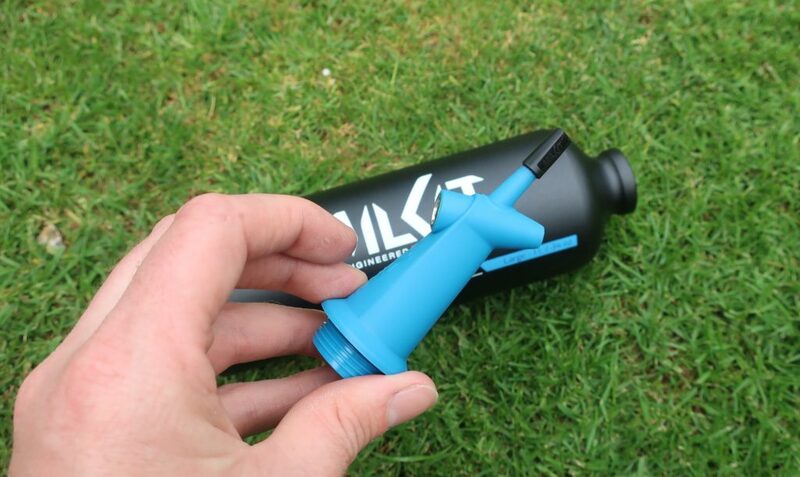 The MilKit Booster when not attached to a suitable container, is certainly the smallest tubeless inflator on the market. The Booster, as you’ll see above, is little more than a plastic device with a presta valve, an air release and a threaded insert. Simply screw it into a SIGG style alloy drinking bottle. (SIGG do not recommend their bottles for high pressure applications). Hey Presto! 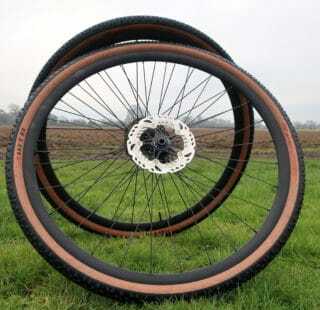 You have a high pressure reservoir from which you can inflate your tubeless tyres. That’s all there is to it. You can purchase the Booster on its own for £25 or with a ‘SIGG style’ 600ml bottle for £35 and £40 for the 1 litre. Early adopters of tubeless technology will probably have tried making ghetto tubeless inflators. A large coke bottle with a valve jerry-rigged in the cap and plenty of gaffer tape was the popular solution. MilKit have taken that concept and turned it into a saleable product. The official MilKit bottles have simple instructions. Just in case you forget how to pump it up! While the idea of using an alloy bottle as the air canister is a neat trick, bear in mind, drinking bottles tend not to be pressure tested. My inclination is to stick to the MilKit branded one which has been tested to withstand constant use at 160psi. Our quick test involved inflating a 35c Panaracer Gravel King SK onto a new Halo Wheels Vapour GXC rim. Step 1 is to inflate the 1 litre alloy canister to 160psi. 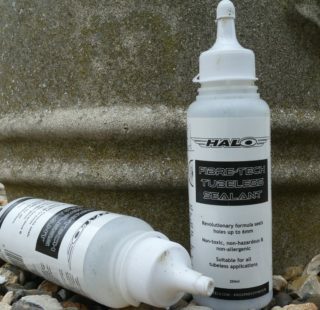 Canister primed and ready for action, simply remove your track pump from the Booster, set the air release valve on your tyre and press down hard to release the air into your tyre. Stand back and smile smugly at your inflated tyre. 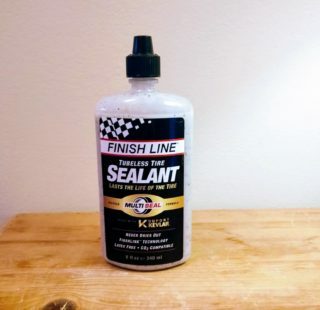 MilKit Booster surveys a recent tubeless inflation victory. Following the same procedure as before, I started to pump the MilKit Booster up to pressure but at 100psi – disaster! The Booster exploded with a bang, and I was smacked square in the wrist by a high velocity, 1 litre aluminium bottle! Wondering where all the blood was coming from, I soon discovered that the inflator head had made a good incision in my shin as well. We aren’t engineers but from the damage to the unit, it seems entirely reasonable to assume the fault lies with the plastic thread. You have to ask whether plastic is an appropriate material for high pressure applications? Secondly, screw top, aluminium water bottles tend to have comparatively shallow threads so this may put too much pressure on the The Booster’s plastic threads. On the face of it, it could be an accident waiting to happen. The plastic thread on our MilKit Booster clearly wasn’t strong enough to withstand the pressures it is intended for. You can’t rule out operator error. It is a possibility but, conscious of dangers implicit when messing about with kit under high pressures, everything was done to follow the instructions. If this happened in relatively benign conditions, fiddling about with the Booster in the cold, dark and wet might be potentially hazardous. 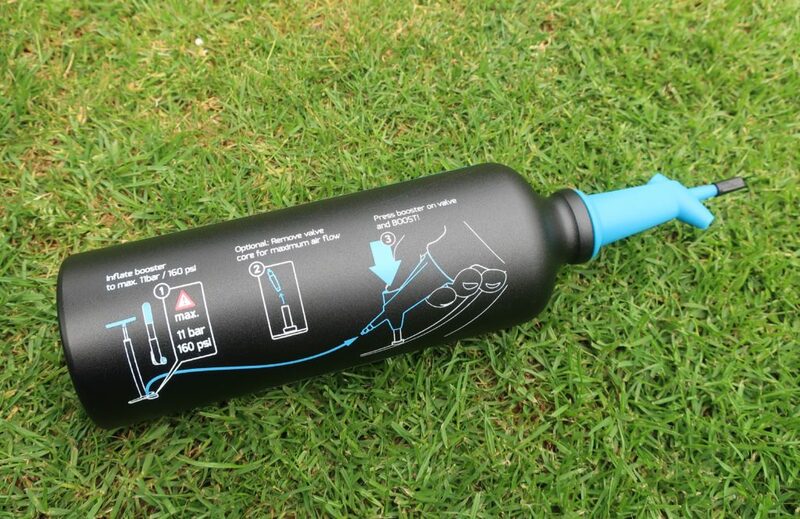 The concept is simple – make the ‘ghetto tubeless inflator’ safe and trail portable. Great idea! It is portable. From my experience, in the current configuration, it is far from safe. On another note, I am not sure whether you are being encouraged to carry one around “charged”. (Airshot – a far more robustly constructed item, caution again this.) If not, I am not convinced that a hand pump will get you up to 160psi without the seals going. Let’s not even mention having the strength required! On the basis of first hand experience, we have very reasonable concerns regarding the safety of this product. We cannot recommend it unless we are convinced the issues have been ironed out. If you do buy one however… caveat emptor! 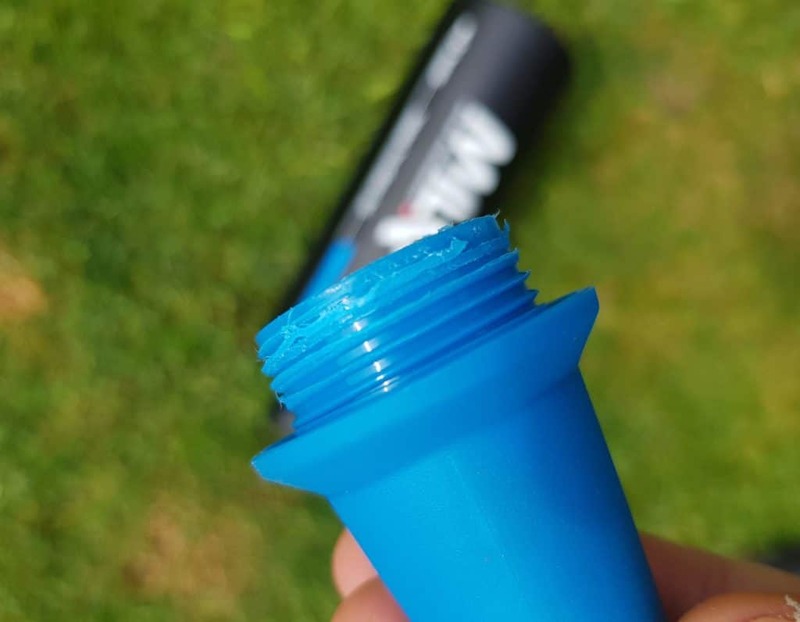 Our two favourite tubeless inflator devices on the market are the Specialized Air Tool Blast and the Airshot and we strongly recommend either of these. Meanwhile, we will update this article with MilKit’s explanation when it arrives. After recalling the original inflator head, MilKit have released a revised version onto the market. The new design is black rather than blue and the advice is to immediately stop using the blue head and return it for a replacement. We now have the revised model in the office and can confirm that the threads do appear to be much stronger than those on the original, blue model. The head is still manufactured from plastic, but we are assured that it is now a much stronger material than previously used. 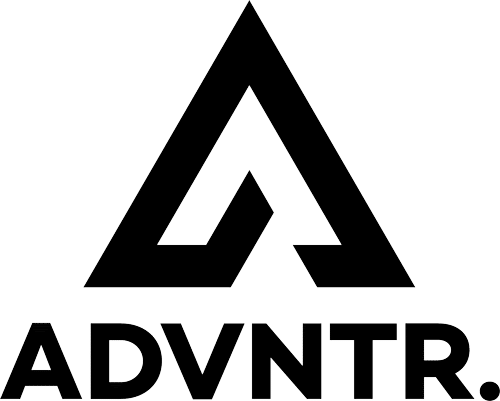 ADVNTR Media Ltd. have taken the decision to decline testing the revised version of the MilKit Tubeless Booster.